Some years ago I bought this plate for $250. The vendor told me it was Ming dynasty but looking at the info at your site, I doubt it. Can you please help me telling if it is a genuine Ming or a fake ? I have looked at your pictures and it is unfortunately not a Ming dynasty piece. From the pictures it looks like a Qing dynasty, Kangxi (1662-1722) period dish and a quite good one at that. 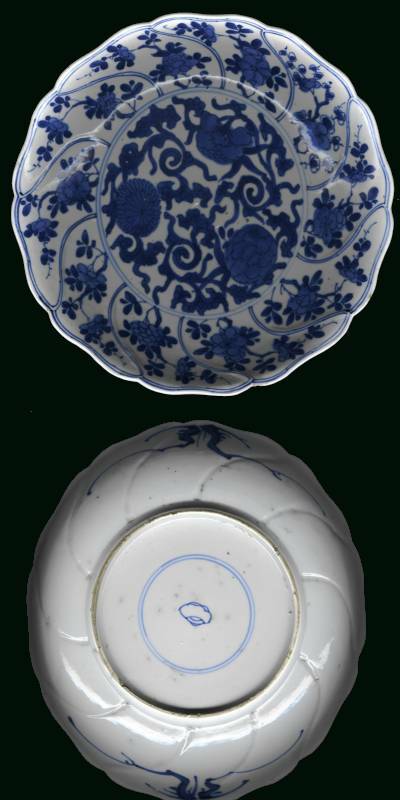 What leads me to this assumption is the style of the decoration, the way its shape is molded into panels (this could indeed occur earlier but the overall impression is typical Kangxi style anyway) the shades of the blue decoration, the well painted pair of branches under the rim and, from the symbol on the base within the double rings. The somewhat carelessly finished foot rim also looks as it should. The symbol on the base seems to be one of the "Eight Precious Things", which often occurs as decorative motives and sometimes individually as porcelain base marks. In this case, it is probably the "Jewel" or "pearl" which is indicated. If you would like more information on this I would like to suggest you visit my MARKS section under "Symbols". If this is really the case - and from the pictures it looks ok - your dish is by no means a "fake". As for the price you paid, that also seems fair and good for a Kangxi dish of this size. I am not good at appraisals and would rather not even indicate any value on anything I have not personally looked at, but I could as my personal opinion mention that - depending on the condition - a dish like this today should be worth between $450 and 600 in good/perfect condition. If cracked and worn it would be less - maybe $150. All this of course provided that it is as good as it looks on the pictures. To be perfectly certain about this, nothing except a personal look would do.